Sign on alley's entrance blames "circumstances beyond our control." 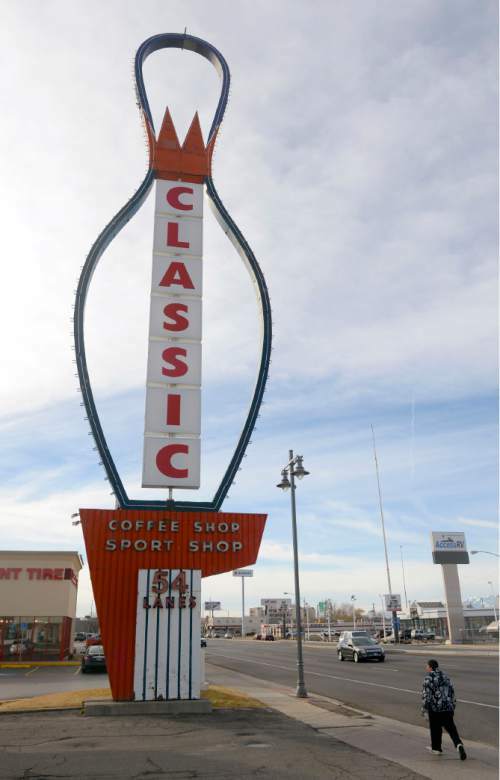 Al Hartmann | The Salt Lake Tribune The iconic sign for AMF Ritz Classic Lanes still stands along 2265 S. State St. Thursday, Feb. 5, 2015, while salvage work goes on inside the 54-lane bowling alley. A sign on the alley's main entrance, "We're sorry to say that AMF Ritz Classic has closed. Thank you for your patronage and support over the years." Al Hartmann | The Salt Lake Tribune The iconic sign for AMF Ritz Classic Lanes still stands along 2265 S. State St. Thursday, Feb. 5, 2015, while salvage work goes on inside the 54-lane bowling alley. A sign on the alley's main entrarnce reads, "We're sorry to say that AMF Ritz Classic has closed. Thank you for your patronage and support over the years." 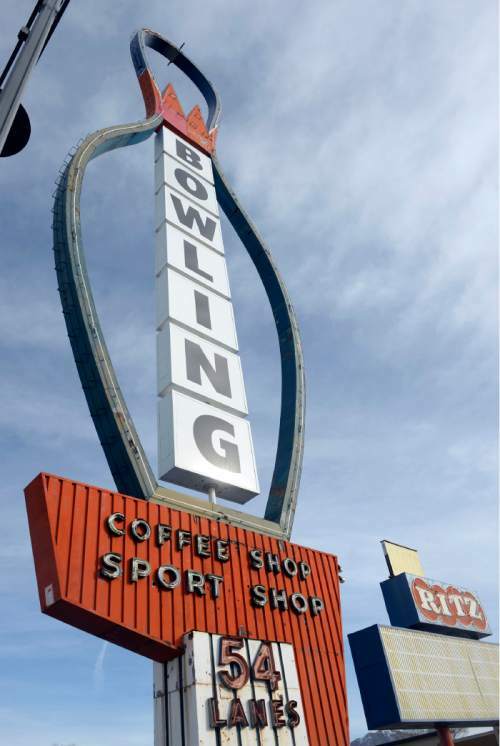 Al Hartmann | The Salt Lake Tribune The iconic sign for AMF Ritz Classic Lanes still stands along 2265 S. State St. in 2015, while salvage work goes on inside the 54-lane bowling alley. A sign on the alley's main entrance reads, "We're sorry to say that AMF Ritz Classic has closed. Thank you for your patronage and support over the years." 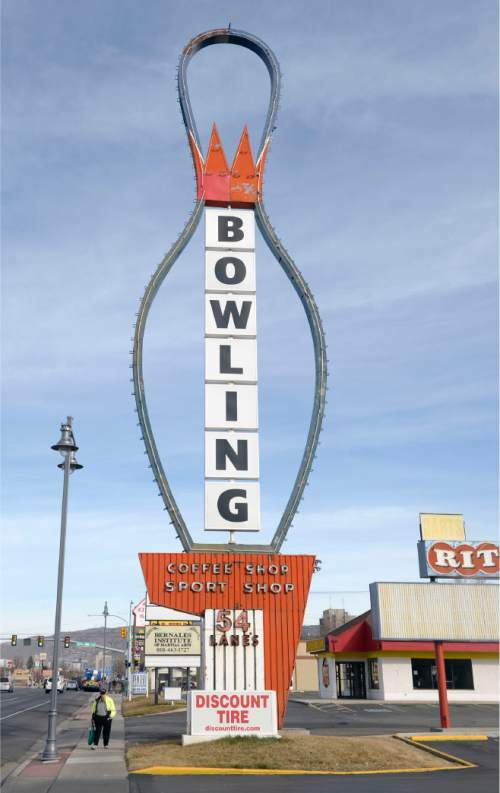 Al Hartmann | The Salt Lake Tribune The iconic sign for AMF Ritz Classic Lanes still stands along 2265 S. State St. in 2015, while salvage work goes on inside the 54-lane bowling alley. A sign on the alley's main entrance reads, "We're sorry to say that AMF Ritz Classic has closed. Thank you for your patronage and support over the years." 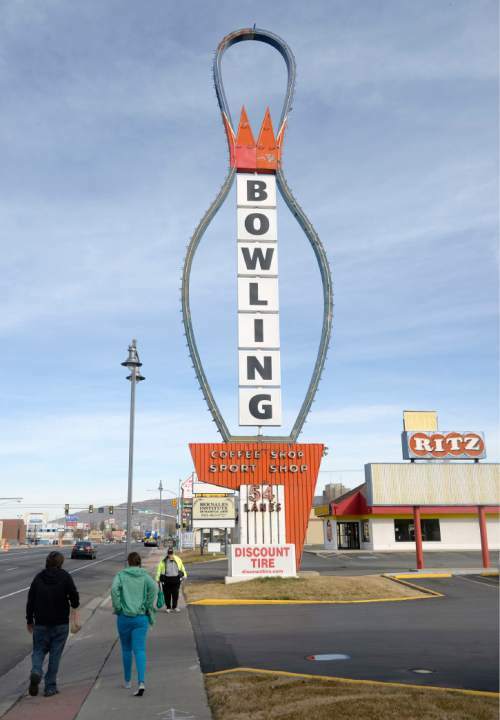 Al Hartmann | The Salt Lake Tribune The iconic sign for AMF Ritz Classic Lanes still stands along 2265 S. State St. Thursday, Feb. 5, 2015, while salvage work goes on inside the 54-lane bowling alley. A sign on the alley's main entrance, "We're sorry to say that AMF Ritz Classic has closed. Thank you for your patronage and support over the years." 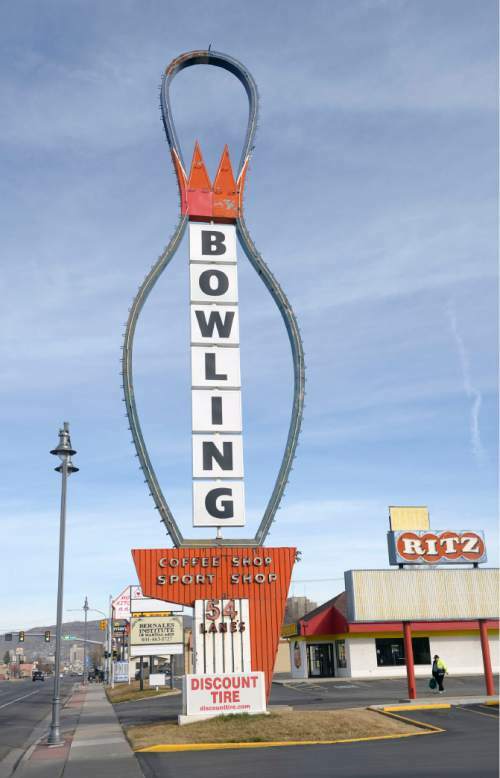 The well-known Ritz Classic Lanes bowling alley in South Salt Lake, with its landmark neon bowling-pin sign towering over State Street, has closed down. The decades-old complex of bowling lanes, snack bars, pool tables and dance halls at 2265 S. State St. was being dismantled for salvage Thursday. The bowling alley manager said he could not comment, but the site&apos;s operator, Virginia-based AMF Bowling Worldwide, confirmed the closure on its website while offering no details. A paper sign on the alley&apos;s main entrance blamed its shuttering on "circumstances beyond our control" and said it would remain closed indefinitely. "Our humble apologies," it read, "and thank you for your patronage." AMF Bowling, which runs about 260 bowling alleys across the U.S., filed for Chapter 11 bankruptcy in 2012. Company executives cited long-term revenue declines as older blue-collar bowlers, who once hit the lanes at least weekly, are replaced by younger middle-class patrons, who bowl less frequently and expect more upscale amenities. An AMF representative in Mechanicsville, Va., could not be reached for comment. The Ritz Classic opened in 1958, property records show. Its closure felt like an era&apos;s end to many devoted customers and longtime bowling league players, some of whom have thrown strikes, spares and gutter balls there for more than a generation. Several were still scrambling Thursday to find other places to host their competitions. "It came as a shock to everyone," said Cindy Burnham, a bowler from Midvale whose Saturday night league has relocated to Big City Bowl at 7980 S. State. "They just told us the land was sold." Salt Lake County records still list the parcel&apos;s owner as iStar Bowling Centers, part of a New York investment firm that leased the Ritz Classic alley and about 185 other centers across the country to AMF. But an analyst with Salt Lake City-based EquiMark, which tracks multifamily residential construction, said the site recently had changed hands and was a likely locale for new apartments. The 4.11-acre parcel sits adjacent to the Utah Transit Authority&apos;s S Line, carrying streetcar passengers east and west along 2250 South to and from Sugar House. Transit access has made the lot a prime spot for high-density development, city officials said. South Salt Lake rezoned it and other land along the streetcar route last fall to allow additional commercial uses, including residential buildings up to five stories high, according to Michael Florence, the city&apos;s director of community development. Planners at City Hall have not received any building permit applications related to the bowling alley site as yet, he said. The Ritz Classic&apos;s vintage sign is labeled as "iconic" in the city&apos;s rezoning ordinance, which also offers incentives for future owners not to tear it down. "We wanted to keep some history there," Florence said.